2 of 4 Place onion, sun-dried tomatoes, garlic, broth, tomato paste, rosemary, oregano, 1/4 tsp of the salt and the black pepper in slow cooker. Stir to blend. Stir in beans and place kale on top. 3 of 4 Cover and cook on HIGH for 4 hours or LOW for 6 hours. 4 of 4 Add remaining 1/4 tsp salt. 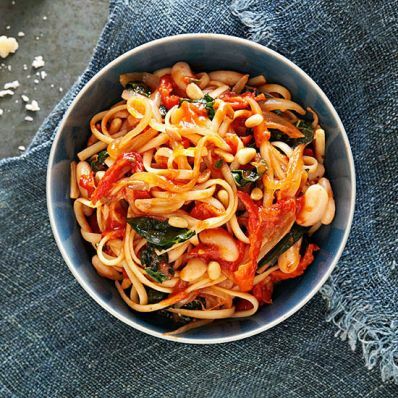 In a large bowl, toss sauce with cooked linguine and olive oil. Stir in Parmesan and sprinkle with pine nuts. Per Serving: 23 g pro., 12 g fiber, 72 g carb., 3 g sat. fat, 762 mg sodium, 17 g Fat, total, 487 kcal cal., 45 mg chol.